Spigot’s flagship product Ashwa is a comprehensive Hospital Information System (HIS) or a Hospital Information Management System (HIMS) designed for large and super-specialty hospitals. Ashwa helps Hospital Administrators maximize the ROI from their operations by managing patient and administrative information in an efficient, intelligent and timely manner. This streamlines communication within and outside the Hospital, reduces manpower needs, and brings cost savings in the process. Ashwa is agile, affordable, web-based and can adapt well to in-premise, hosted and cloud infrastructure seamlessly. It’s intuitive, easy to use, and comprehensive, covering all aspects of a hospital’s workflow, right from the time of patient registration. Ashwa is built on highly scalable architecture that is future proof, with different product variants that cater to different kinds of healthcare centres. Further, Spigot provides excellent technical support with small turnaround times in case of any issues. Ashwa comes in three variants namely Standard, Advanced and Enterprise. 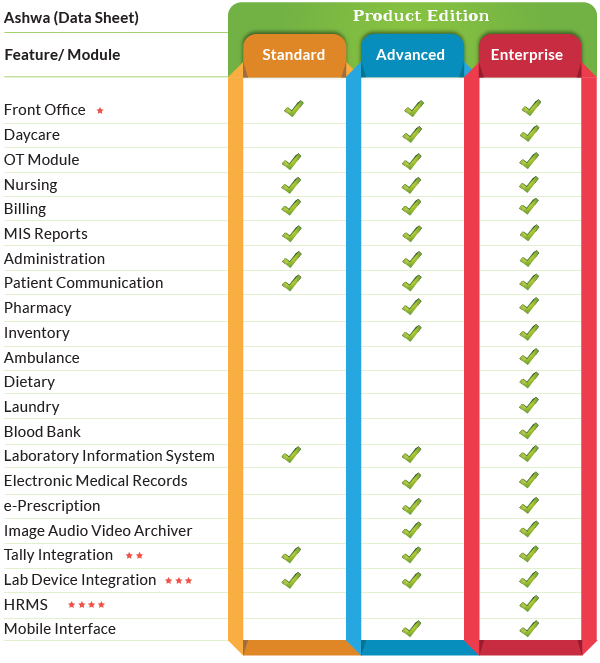 Ashwa Standard provides the core HIS features with basic configurability for OPD only, OPD with Lab features and OPD, Lab & IPD. The table below provides complete feature set supported by Ashwa across various variants of Ashwa. Includes all the basic functions related to OPD, IPD, and walk-ins that are to be handled by the front office like Registration of patients, Ordering Services, managing appointments, etc. Tally integration will be done only on specific need of a customer. Lab Device Integration will be done based on need of a customer and customer has to expose the API's of the device interface to Spigot HMS software. This also can be given along with standard and advanced module as an A-La-Carte module.